An overwhelming majority of US and Canadian citizens are entirely unaware that an especially dangerous device has been attached to their homes. While installation of “smart meters” across North America has continued apace since 2009 the health effects such devices pose have yet to be fully realized. Left unaddressed the broad use and continued deployment of such equipment will almost certainly influence human health for many generations to come. On May 22 my household received a “Notification Letter” from Florida Power and Light (FPL) stating the company’s intent to replace our existing analog meter with a new device equipped to communicate with other such meters in the utility’s wireless “mesh network.” According to FPL we are among roughly 20,000 of Florida homes that have rejected the new digital device in lieu of an analog model. The letter carries the industry’s familiar line–that the “meter upgrade” is intended to “provide you with more information so you can take more control over your energy use and monthly bills” while more readily “identify[ing]” and resolving power outages. The correspondence came as quite a surprise since in late 2011 after explaining to FPL the health-related consequences of such electro-pollution and expressing concerns for my family’s well-being, the company agreed to remove the “smart meter” and replace it with one that does not emit such energy. This was done only after conducting my own investigation, providing the company with substantial medical research documenting the negative health effects of RF microwave radiation, and threatening legal action. FPL was in fact much more reasonable in addressing my concerns than was the Florida Public Service Commission, whose legal counsel informed me flatly that the body had no authority over smart meter deployment and referred me to the Federal Communications Commission. Only after submitting a public records request to the agency did I discover that the information Commission members accepted to evaluate the safety of such equipment in terms of human health consisted largely of smart meter manufacturer and utility boilerplate, including a FPL “PowerPoint”-like presentation seemingly pitched to a fifth grade audience. Upon receiving FPL’s May 22 letter I took a few hours to write a response to the company’s president, taking care to outline my past communication with them, the concerns I have over the device’s potentially negative effects on my family’s health, and the fact that they recognized and fulfilled my opt out request almost two years ago. A few days after sending my letter off, the executive’s assistant called to inform us the notification letter was likely the result of a computer glitch and should have never been sent. The foremost danger of smart meters is that they are designed to communicate with each other by emitting substantial and frequent bursts of radio frequency (RF) microwave pollution several thousand times per day–a cumulative burden on one’s genetic and biological makeup that children and the elderly are especially vulnerable to given their respective developing and degenerative conditions. Yet the documented health effects are something FPL never voluntarily told me about, and your power utility will likely not tell you. Yet other sources I consulted observed that such emissions are much more frequent. I thus purchased a German-made Gigahertz Solution HF35C Elektrosmog Analyzer and did my own measurements. To my surprise I found that FPL’s meter was emitting RF bursts in excess of 2,000 microwatts per square meter at a distance of five feet several times every thirty seconds to one minute. This pulsing radiation was detected in varying degrees of intensity elsewhere throughout the home and may have at least partially explained the common symptoms of electro-hypersensitivity I was experiencing. If the US public was served by a more honest and diligent press smart meters and RF radiation in general would not endanger public health to the extent they do today. This is particularly the case since a multitude of scientific studies exist that point to the deleterious health effects of RF energy exposure–especially in children and the elderly. Such information is intentionally overlooked by power utilities and little-if-any acknowledgement of negative health effects appear in any of the vacuous paraphernalia they provide their customers–and state regulators–promoting the meters. When I pressed FPL representatives on what studies the company had conducted on smart meter safety they sent me a privately commissioned 2011 report, Florida Power and Light Advanced Meter Infrastructure & Distribution Automation RF Exposure Survey, produced by an obscure Arlington Virginia firm called Site Safe. [Matthew J. Butcher, Florida Power and Light Advanced Meter Infrastructure & Distribution Automation RF Exposure Survey, Arlington Virginia: Site Safe, June 10, 2011. In author’s possession.] 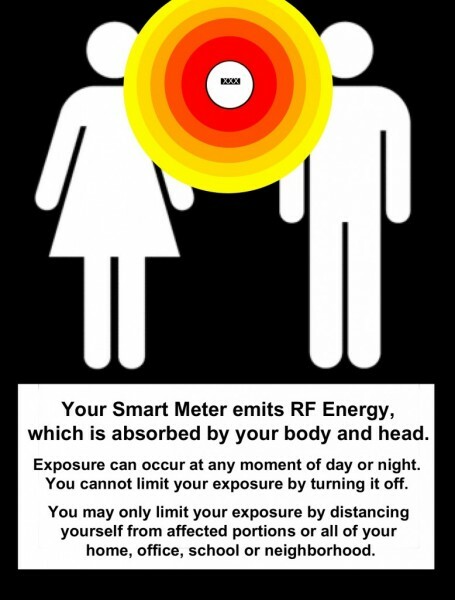 The study’s findings assert that one receives almost the equivalent amount of RF radiation standing one meter away from a smart meter as they would within the immediate vicinity of a cell phone tower–an especially alarming observation! However, the research’s overall flaw and deceptive nature lies in the absence of suitable methodological parameters for examining how smart meters pulse lesser amounts of such microwave radiation throughout the home up to 190,000 times per day. Germany’s Standard Building Biology Measurements of 2008 caution that specifically in terms of human health “pulsed signals [are] to be taken more seriously than continuous ones.” When I contacted the author of the Site Safe study via telephone and email to evaluate his credentials for authoring such a study, he refused to provide me with any information that might confirm such training and expertise. In May 2011 the World Health Organization’s International Agency for Research on Cancer classified RF as a Class 2B carcinogen. This means that caution should be applied because exposure to RF and EMF may cause cancer. Given such an admission power utilities should be exercising the precautionary principal lest they further endanger human health with the continued wide-scale deployment of smart meters. FPL and the broader power industry have produced no compelling scientific evidence to date that even tentatively confirms the safety of smart meters. With this in mind, and in terms specifically related to human health, the power industry writ large is executing a transparently dangerous and criminal fraud against the US public. A half century ago tobacco and asbestos were known menaces to health and over the long term exposure to these substances culminated in a variety of cancers and other terminal diseases compelling the government to intervene on the public’s behalf. The credible scientific evidence suggests the same holds true for exposure to RF microwave radiation. In fact, government and academic research dating to the 1960s points to the potential health dangers of sustained RF and EMF exposure. While the Food and Drug Administration, the Federal Communications Commission, and the American Cancer Society claim that RF and EMF pose no health risks, their conclusions are based on dubious and outdated studies often funded by the telecommunications industry itself. Current independent scientific and medical research paints an entirely different picture. For example, in 2012 the American Academy of Environmental Medicine generated a list of 86 scientific studies and bibliographies on the health effects of EMF, RF and extremely low frequency (ELF) microwave radiation dating to 1971. Referencing this literature, in January 2012 the AAEM Board issued a public statement to the California Public Utilities Commission expressing its concern over smart meter installations across the state. “[E]xisting FCC guidelines for RF safety that have been used to justify installation of ‘smart meters’ only look at thermal tissue damage and are obsolete,” the Board observed, since many modern studies [such as those used by the FCC] show metabolic and genomic damage from RF and ELF exposures below the level of intensity which heats tissues … More modern literature shows medically and biologically significant effects of RF and ELF at lower energy densities. These effects accumulate over time, which is an important consideration given the chronic nature of exposure from “smart meters”. The current medical literature raises credible questions about genetic and cellular effects, hormonal effects, male fertility, blood/brain barrier damage and increased risk of certain types of cancers from RF or ELF levels similar to those emitted from “smart meters”. Children are placed at particular risk for altered brain development, and impaired learning and behavior. Further, EMF/RF adds synergistic effects to the damage observed from a range of toxic chemicals. Given the widespread, chronic, and essentially inescapable ELF/RF exposure of everyone living near a “smart meter”, the Board of the American Academy of Environmental Medicine finds it unacceptable from a public health standpoint to implement this technology until these serious medical concerns are resolved. Along these lines in 2007 and again in 2012 the BioInitiative Working Group, an international body of academic scientists, medical doctors and public health professionals released a comprehensive review of over 2000 scientific studies and reviews, concluding that RF and EMF exposure can contribute to childhood leukemia and lay the groundwork for a variety of adult cancers. Finally, the collection and uncertain wireless transmission of intimate data related to a family’s domestic power usage and everyday life encompassed in residential occupancy also serve as a potential basis for the violation of protections from illegal search and seizure guaranteed under the Fourth Amendment to the US Constitution. This lifestyle-related information relayed throughout the mesh network via RF microwave may be easily “hacked” and the broader network attacked by any number of third parties, including criminals and terrorists. Such data may also be easily accessed by police or other government agencies that would otherwise need a warrant and probable cause to access such information. Utility customers should remind power companies that they do not consent to any personal data related to electrical usage and living patterns aggregated and sold to third parties, including marketers, appliance manufacturers, or data analyst subcontractors. Already RF is involuntarily yielded to through the ubiquitous radiation emitted from local area networks (“Wi-Fi”) in places of employment and public areas. This is compounded by the voluntary exposure to RF through close quarter cell phone and household Wi-Fi use. With the combined financial and advertising power of the telecommunications service and wireless-manufacturing industries the research clearly pointing to the harmful health effects of RF remains to a large degree unknown. Given their wide scale use and around-the-clock activity, smart meters complete the circle of what is now ceaseless RF bombardment; their broad deployment anticipates a not-too-distant future when they will engage with “smart” appliances within the home, further disseminating such radiation while arbitrarily exerting power over everyday energy use and unlawfully collecting vital and likely profitable data on behavior and lifestyle.